Firstly, it’s great talking with you. You’ve played with everyone. Very few have played with these people..
Yeah, I have played with the likes of Smashing Pumpkins, Ray Charles, B.B. King and..
..John Fogerty (Creedence Clearwater Revival leader), Bob Dylan. Yes. What about Johnny Cash, Willie Nelson? What about classical, jazz, rock, pop? All these guys. I’m very very lucky. Just ask my ex-wife or my girlfriend. I was trained classically since young age to do this. Some other drummers I’ve talked like John Densmore (The Doors) and Bill Bruford (Yes,King Crimson) have already quitted. Probably,it’s hard to be always active. Yeah, I want always to do things,to be active. I don’t know for the others. I have very huge resources of energy inside me. 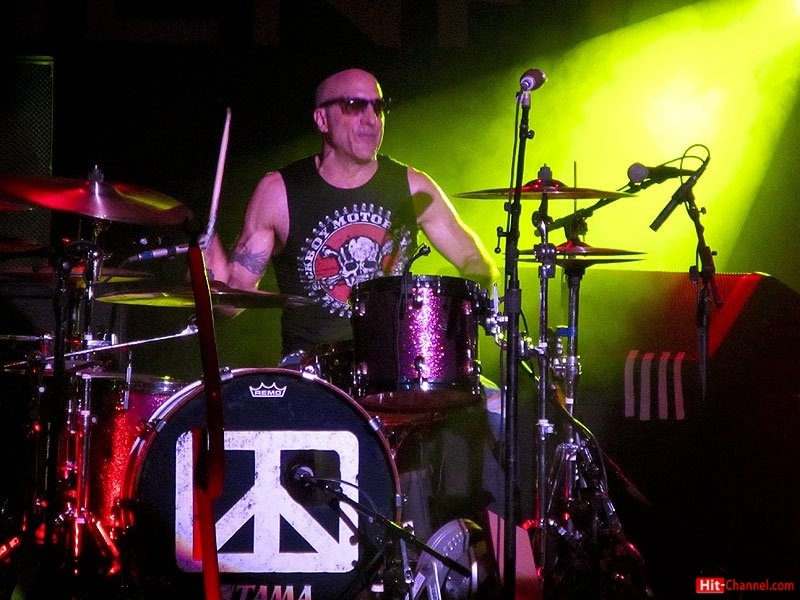 You will tour for the new Chickenfoot album “Chickenfoot III”. How that invitation came up?Are you friend with these guys? Chad Smith won’t tour for this. Last year,I was called to fill in for Chad (ed:Smith,Red Hot Chili Peppers drummer). Chad had an accident last year. He hurt on. And a manager called me to tour instead of Chad and I had to cancel my different things. I had to cancel sessions but I was willing to do this. I was excited. I liked that idea. Who played in the album? Chad (the interview happened in early September)? Chad is in the album. I’ll do the tour. I have a great respect for what Chad is. Ok. You play with the great John Fogerty, a hero of mine, since 1997’s “Blue Moon Swamp”! How scary is being onstage with him? With John have a very good relationship. He’s very very demanding. He demands perfection. We do a 4-hour soundcheck. Yeah,we rehearse for 6 hours. But I understand what he wants: he demands perfection,he demands my energy. I was his 30th drummer in six years when he made “Blue Moon Swamp” and his last one. And he told me “You’re the best drummer I had in my whole life”. Wow!Will you record anything soon with John Fogerty? Do you feel comfortable when you record with pop artists like Avril Lavinge,Celine Dion and Ricky Martin ? Yes, I feel very very comfortable! I think it would be easier that stuff for you. No, it’s doesn’t matter who is this. It’s just a creative part, it’s a challenge for me. It’s like a doctor who gives birth to a child, he has done this many many time but each time is very special. It’s very challenging to do everytime a new thing,to do a new song. People keep sending me: music from Russia, music from China, music for movies. You have to be very serious to do this thing. I’m like an actor: you have to figure out what the film is about, you have to read the script,to see the problems. I do it. You have to take it seriously. Do you think playing with B.B King was one of the best moments of your life? Yes,it was great. He says “hey drummer, play this for me” and he asked me things, he wanted my energy. What was the most important thing you learned during the period you played with John Mellencamp? Playing with Mellencamp I learned so many things with that band.I learned how is to play with a singer/songwriter. How to support songs.Previously,I was just playing drums and being with John Mellencamp I learned so many things about music business. I learned to be a drummer in a band and playing songs. So,I supported songs. That is the hard thing: to come up with simple,creative ideas. It’s very very difficult. To be like Ringo Starr (The Beatles drummer),supporting others’ music. How much creative still is Willie Nelson at studio? Are you surprised by his powers in his age? Willie doesn’t say anything. Producer says everything. Willie is very, very friendly. He’s very good. Do you remember any unknown/unexpected/funny fact or trivia from Iggy Pop’s ‘Brick By Brick’ album? Yeah, I remember everything.I remember once, I played so aggressively, I wore no T-shirt then and I had to use taping to hold my headphones in my head because I played so hard. And I remember Slash and the other guys who played there. I have good memories. How it happened to play in Bob Dylan’s “Under the Red Sky” album? There was a great line-up there with George Harrison, Stevie Ray Vaughan, Slash, Elton John, Bruce Hornsby. I was called and I was very excited. I was very lucky because he let me to be the drummer for everything. I recorded all the drum sessions. I did it in four days. I was recording every day. It was spread out. In first session it was Stevie Ray Vaughan and Jimmy Vaughan, and that was short before Stevie Ray died. I remember that date, it was January 6th (1990). I was very honoured to play for Bob Dylan. He said one thing, the only thing he told me: we shook hands and he told me “Hi, I’m Bob Dylan. Nice to meet you”. Recently I read an interview that fellow drummer Henry Spinetti (Eric Clapton,George Harrison,Paul McCartney) gave, saying that the first time he recorded for Dylan,they shook hands and Dylan started to play. He never told him what he wanted, he never gave any instruction. He had to follow him. Dylan never says anything. He just starts a song, he starts playing. Was Jon Bon Jovi an easy-going person to work with? You played in both his solo albums. He’s very very hard working. Very perfectionist. He’s incredible. I respect him a lot. Tony Iommi has a huge respect for you. How is being admired by the Riff Master? Not me, Tony Iommi told that in an interview he gave to a friend of mine,Chris Kissadjekian from Greek Metal Hammer where he said “the unique Kenny Aronoff”. Which are the current projects you’re involved in at the moment? I’m recording with John Fogery. I’m always at studio. Andy Johns (Led Zeppelin,Rolling Stones engineer) is at the moment in my home studio recording for a new artist. It’s an unsigned artist. My father and my mother,definitely my parents.My teachers,all my teachers.They changed my life. Musicians from Boston City Orchestra, a percussionist from Boston City Orchestra. My professors at university,and particularly George Gaber. I spent 4 years at university and one year at Ashton Music Festival and then my athletics coaches. Which sports do you exercise? In America we call it “soccer”. I’m playing soccer and I do shore skiing. In the mountains of Vermont and in west Massachusetts. Are you still exercising or you did it in the past? I’m still exercising. I think I’m in good shape,I’m pretty strong. Was it difficult to be accepted by Lynyrd Skynyrd’s fans? The have a reputation as very loyal to the band. This could be an issue with anything. When I was in Smashing Pumpkins some fans were saying “you’re not Jimmy Chamberlin” and I understand that. I had to hang my head down and do my job. Some people liked what I did and some people didn’t. The same with Chickenfoot, the most of people like the idea to fill in for Chad and some didn’t. I think you’re a better drummer than Chad.That’s what I think. A lot better. I think you have a larger range than Chad. That’s because I have a broader education, I have played many more sounds, many more records.It’s gonna be great. Previously you said about Vermont. You have also played with Trey Anastasio (Phish guitarist, living god) in his “Shine” solo album. Did you enjoy playing with him?I think he’s a genious. I love that band! But they’re unknown in Europe and especially in Greece. I know that. I was in that session with Brendan O’Brien, the genious Brendan O’Brien. Do you know him? Brendan was playing bass, I was the drummer and Trey was playing guitar. He was fantastic! You know, Trey is Greek! Yes. Anastasio means “resurrection” in Greek. Just yesterday, I ate in a Greek restaurant. Yes,with Smashing Pumpkins in 1998. I was very young then. I didn’t know Smashing Pumpkins then. Send a message to Greek listeners.. I love Greek food and Greek people. Hope to play there soon. Tell John Fogerty to come play in Greece!! Roger Waters filmed a DVD for “The Wall” in July and he admires John Fogerty,John Mellencamp and Bob Dylan. You have played with all three of them. You know how it is: it’s all about money. If he gets the right offer, he’ll come (laughs). He’s a professional artist. I hope to come back to Greece.I thank you so much. No, it’s my pleasure talking with you! 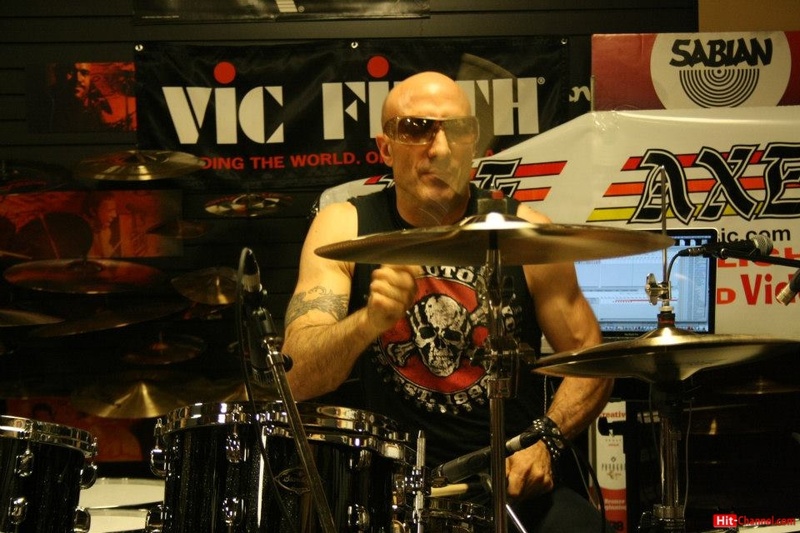 A huge “THANK YOU” to Mr Kenny Aronoff for his time and his great answers.